The audience is now Attacked: The Attack on Titan live-action movie premiere hit like a ... well, like a titan, I suppose, and the reviews are generally positive. ANN's correspondent described it as being more like a horror movie than anything else — a relief to hear, given that live-action incarnations of hard-hitting anime have often been watered down (yes, I'm talking about you, Gantz). 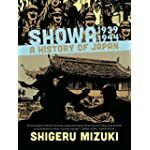 A long-overdue hand for Shigeru Mizuki: Mizuki's Showa 1939–1944 & Showa 1944–1953 won the 2015 Eisner Award for Best US Ed. of International Material-Asia. Kudos are also due to translator Zack Davisson. All the titles in Mizuki's Showa series come highly recommended, and provide a strong antidote to the glorification of the war years that too often passes for history. Nowhere, indeed: The trailer for Mamoru Oshii's new (live-action) movie Nowhere Girl can be seen, albeit sans subs. In truth I'm not holding my breath for this one, as after the terrible word around Garm Wars I'm starting to feel like Oshii has run out of things to say, and ways to say it. I sincerely hope I'll be proven wrong. Udon Rose: Another outta-nowhere licensing announcement: Udon has licensed the original manga of The Rose of Versailles, a piece of 18-century French history put through a genderbent filter and an acknowledged inspiration on titles like Revolutionary Girl Utena. The only previous English-language edition was a very, very limited edition originally created only for ESL students in Japan; I was once lucky enough to hold in my hands a copy of that rare artifact. A pleasure to see it coming out for all audiences. No, I'm not done yet, seriously, I mean it this time: Hayao Miyazaki seems to be setting some kind of record for the number of times someone can come back out of retirement. His next movie project ... no, it's not a feature film, don't go getting your hopes up. Rather, it's a short subject being produced specifically for the Ghibli Museum, Kemushi no Boro ("Boro the Caterpillar"), and it will mark the first time he's been in charge of an all-CGI production. Boom or bust? : On the one hand, anime seems to be a profitable venture (although that Hollywood Reporter piece is rather shallow given the complexity of the industry). 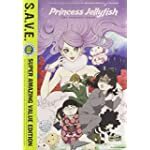 On the other hand, there's worry that the growth of joint Japanese-American production committees is a sign that anime is getting too costly (again). My own take: Joint productions too often just allow more of the same kind of fan-centric junk to be made, rather than being a vehicle for allowing really creative and interesting things to come into being. But we all know the money lies in things fans readily recognize as Anime™ — products, not projects. Tear down this wall! : How do Chinese anime fans bypass local censorship? Lauren Orsini investigates.